Rushing riverfront views, bright and spacious interiors, and beautiful memories can be found at Simone’s Cottage, a 2-bedroom +loft, 2-bathroom cabin rental nestled along the Little Pigeon River in Gatlinburg, Tennessee. 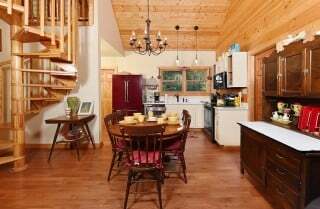 Sleeping up to 8 guests, this charming pet-friendly home features cozy accommodations for families and friends, with 1 king, 1 queen, and 2 twin-size beds. 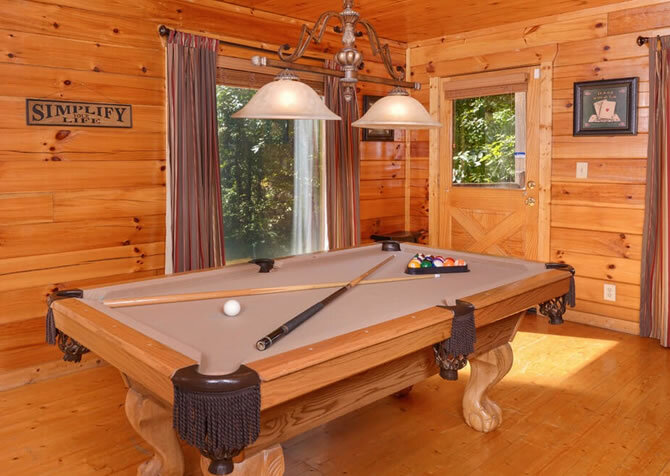 Plus, there’s plenty of entertainment for all, including a big screen TV, a stone firepit, a fun pool table, and an outdoor swim spa. 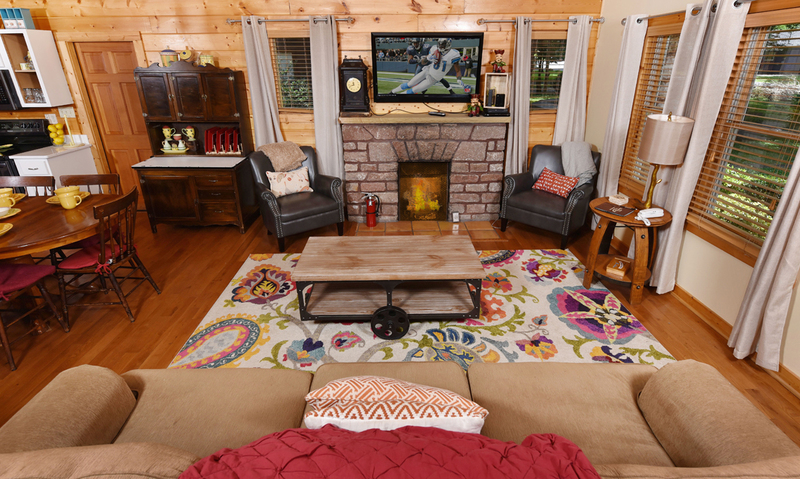 Watch your favorite DVDs every evening, roast hot dogs over an open fire for dinner, play games all night, and enjoy a steamy soak under the stars! Then return inside for a spa bath indoors in the jetted tub before slipping into the cool sheets for a restful snooze in the master suite. Awake to waterfront views through large windows, whip up a hot breakfast in the fully equipped kitchen, and sip coffee under the riverside gazebo. 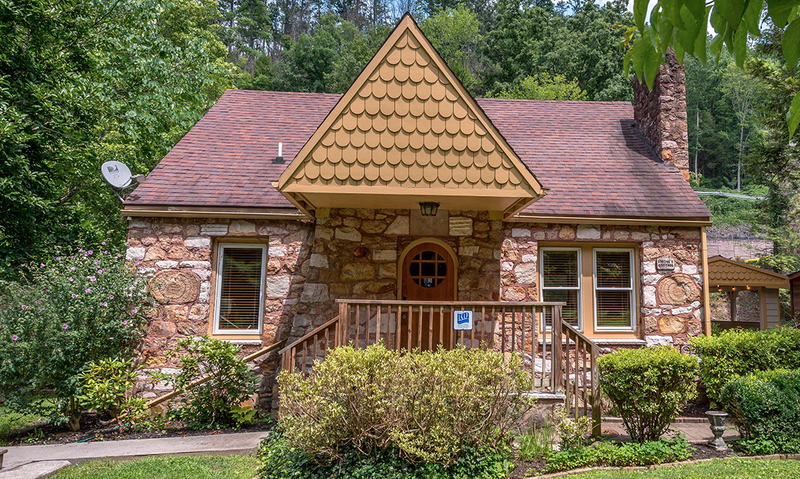 Simone’s Cottage is more than just a place to stay — it’s a place to call home in the Smokies. 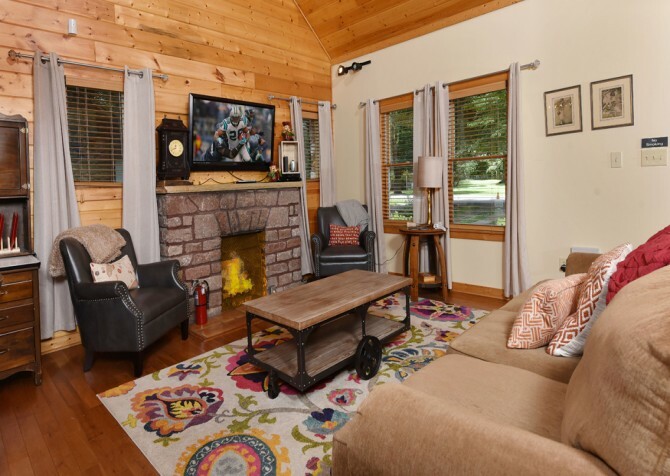 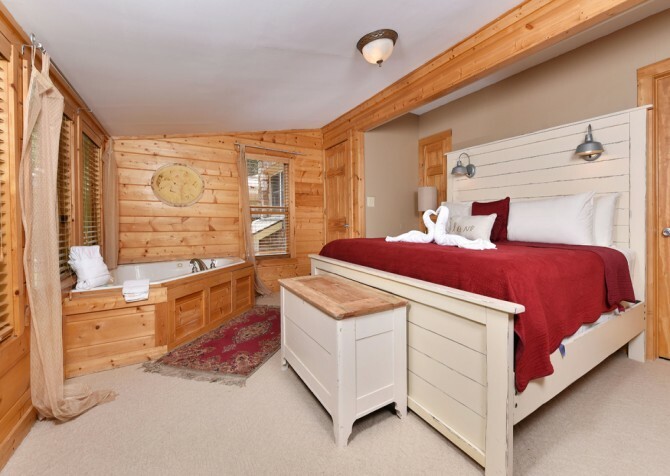 Welcoming and cozy, the living area of this Gatlinburg cabin is furnished with a plush sofa and 2 armchairs, inviting you to settle in and stay awhile. Let the little ones get out their wiggles on the stylish area rug, pile drinks and snacks on the coffee table, and pop in a DVD to watch on the big screen TV. 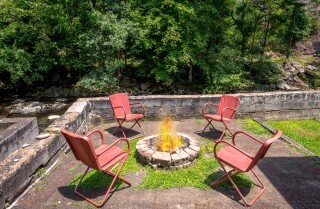 Later, start the gas fireplace, grab a cup of herbal tea, watch the flickering flames dance, and begin a new novel series…you know, the one you’ve been stoked to read. 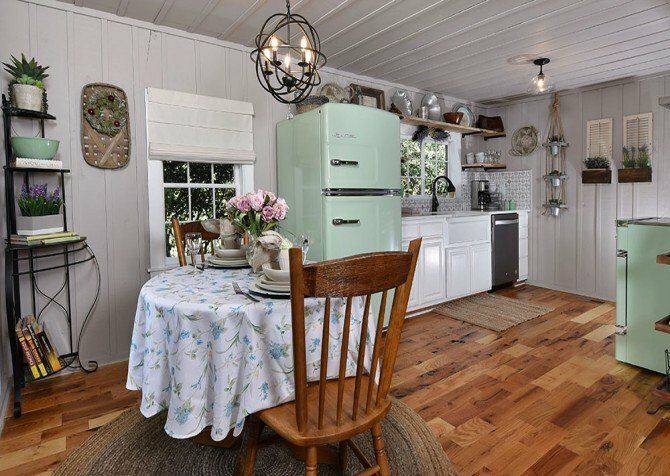 Just off the living room, the open-concept kitchen invites conversation and laughter as you prepare meals or snacks at Simone’s Cottage. 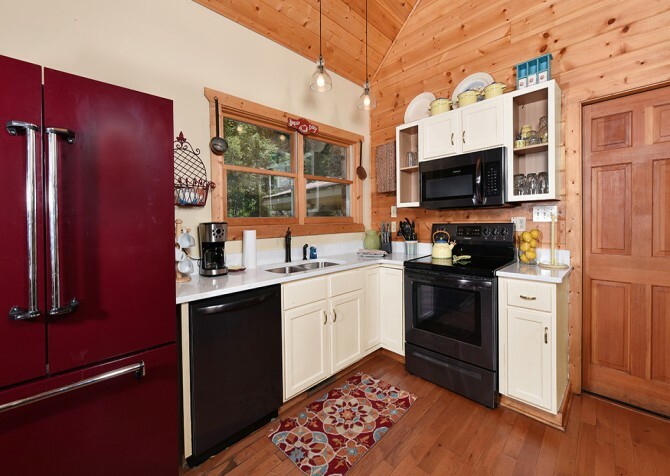 Fully equipped with stainless-steel appliances, a bold-red refrigerator, and all the tools you’ll need to cook a homemade feast, this kitchen is ready for tasty good times! Spend a morning at the Gatlinburg Farmers Market selecting fresh ingredients and make delicious meals and unforgettable desserts for friends and family at the cabin. 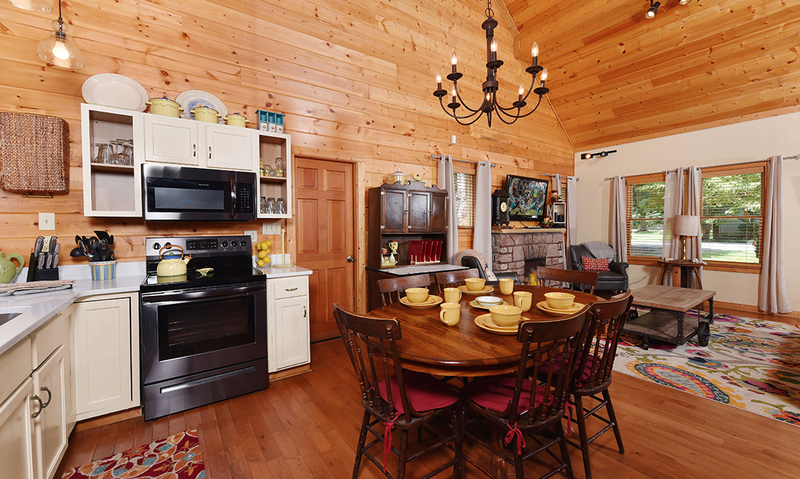 Centrally located, the dining table offers cushioned seating for 6 and a place to enjoy a glass of wine or cider over dinner. The chandelier overhead keeps the area bright, while the buffet to the side provides a safe hub for seconds. 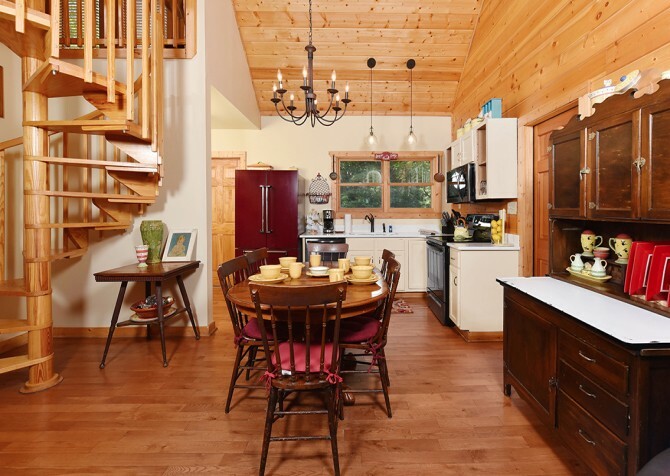 This space is also great for setting out a few board games brought from home or purchased in town or checking emails over Wi-Fi throughout your stay. 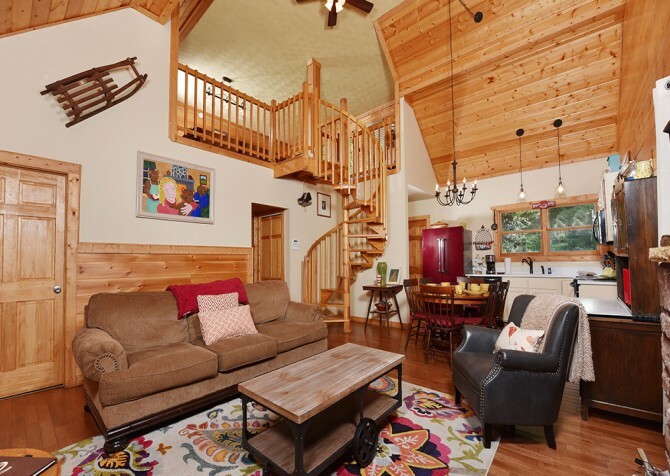 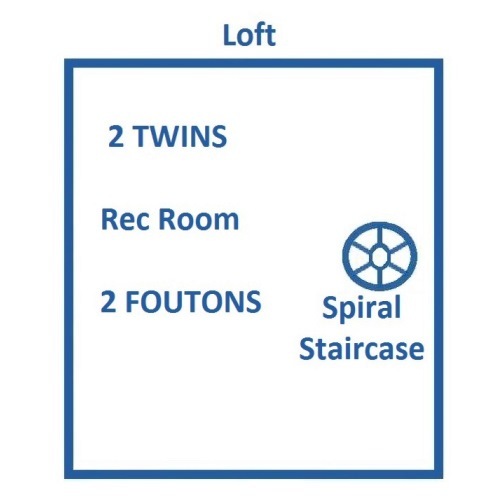 Climb the whimsical spiral staircase and enter the loft to discover another place to relax with 2 futons, a pool table, flatscreen TV, and 2 twin-size beds. This cool recreational and bedroom combination makes for a great kids’ room, so they can play as long as they want and pass out on a comfy bed with a cuddly teddy bear. 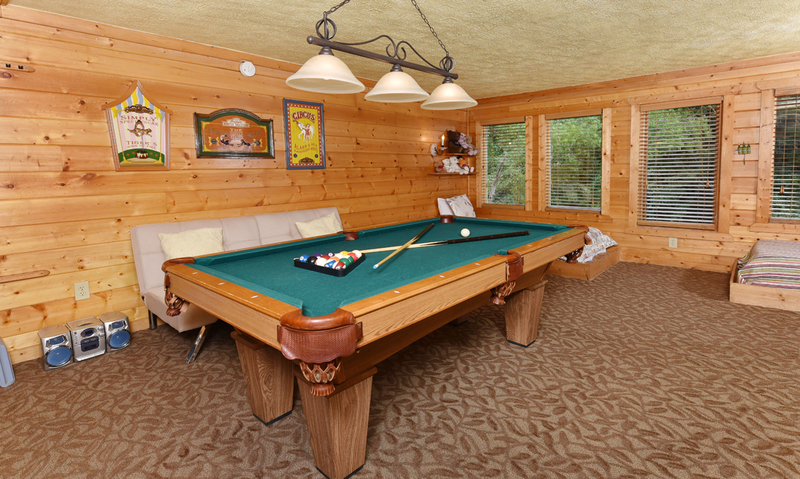 Play pool with your bestie, watch a funny show with the kiddos, and boogie to your favorite tunes on the stereo. 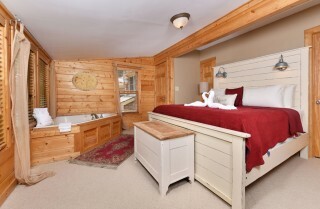 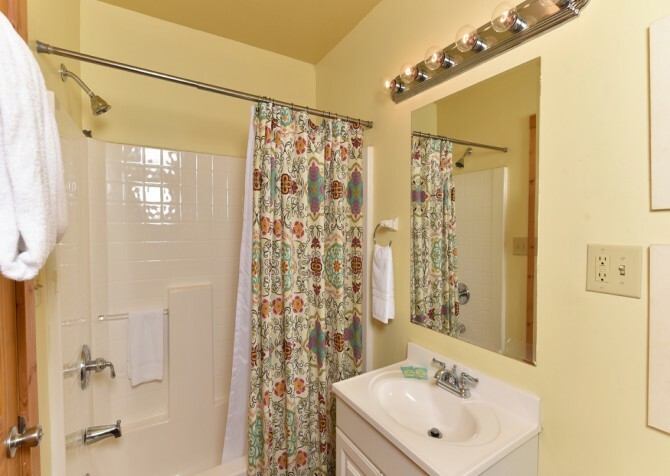 Simone’s Cottage features 2 bedrooms on the entry level, with a loft bedroom (boasting 2 twin-size beds) upstairs. 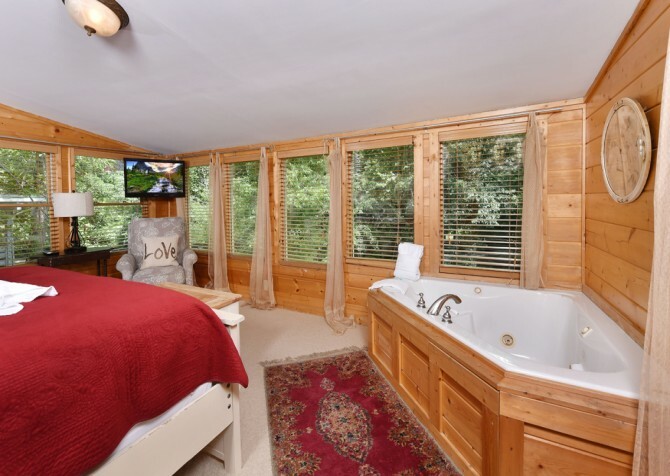 The master suite offers large windows with sparkling river views, a comfy king-size bed, a plump armchair, a mounted flatscreen TV, a private en-suite bathroom, and an indoor jetted tub. 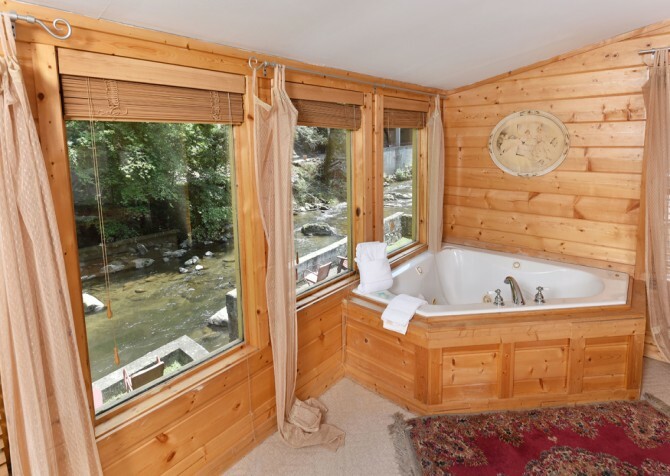 Take in the morning scenery, relax with a good read, and unwind with a spa bubble bath. The second bedroom features a shimmery chandelier, a cozy queen-size bed, a flower-patterned chair, a mounted flatscreen TV, and direct access to a full bathroom. 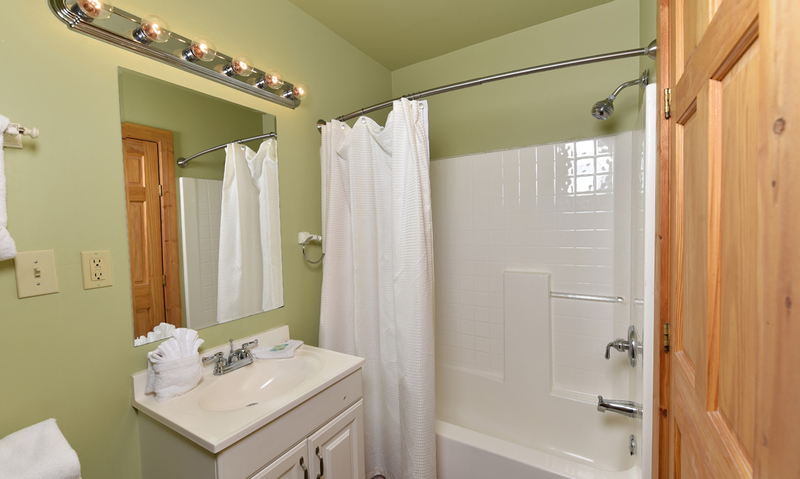 Enjoy a little entertainment before bed, cuddle with your spouse, and get ready in the mornings with ease. From the moment you arrive in the motorcycle-friendly, ribbon driveway of this charming Gatlinburg cabin rental, you’ll be delighted by its quaint stone and storybook-styled exterior. 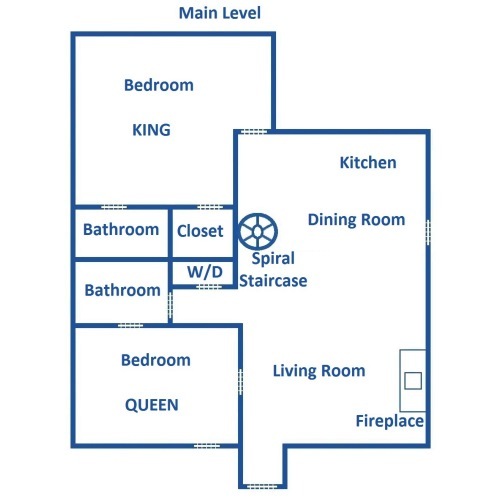 There is parking for 4, room for a trailer, and only 2 steps into the home, so unpacking won’t be a hassle. 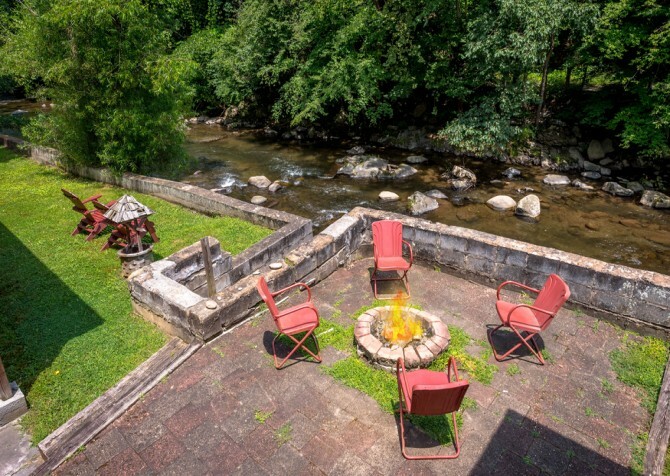 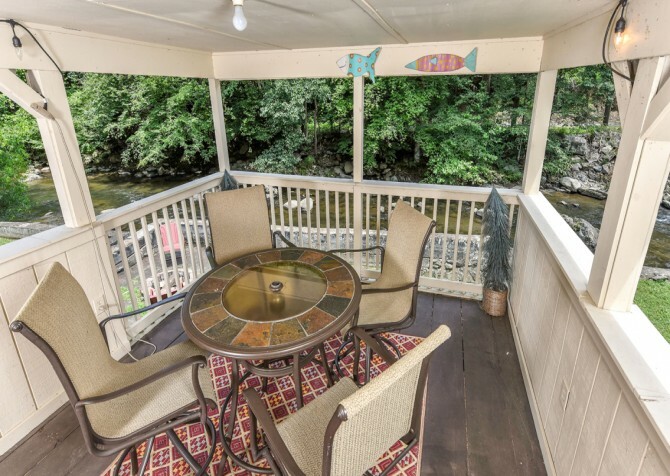 With beautiful views of the Little Pigeon River, you can expect to have a great time outdoors at Simone’s Cottage! 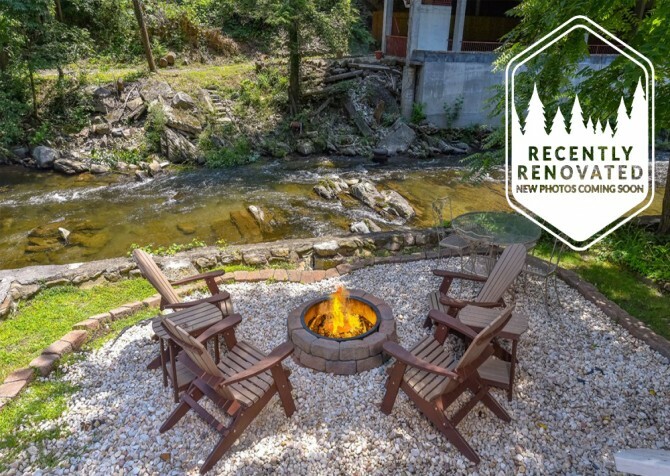 Gather at the patio table under the covered gazebo for a charcoal-grilled dinner in the fresh air or spend an evening making s’mores around the firepit that overlooks the flowing waters. 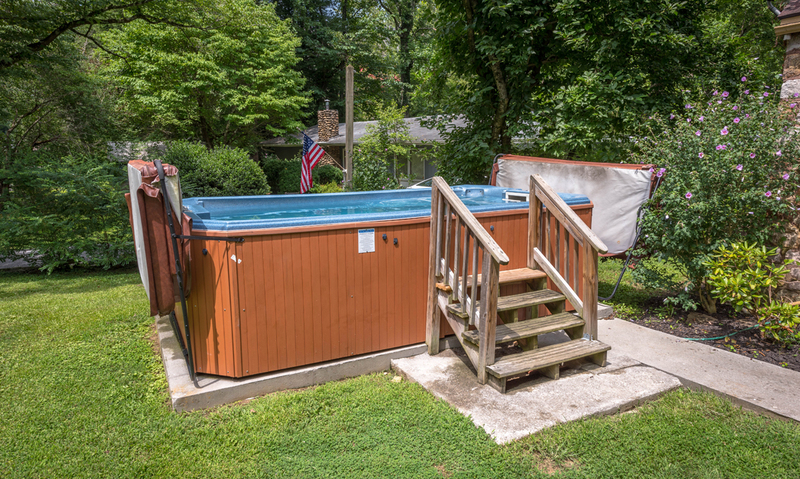 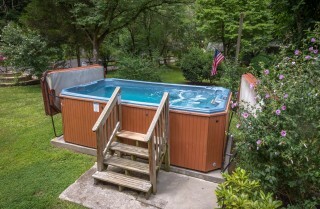 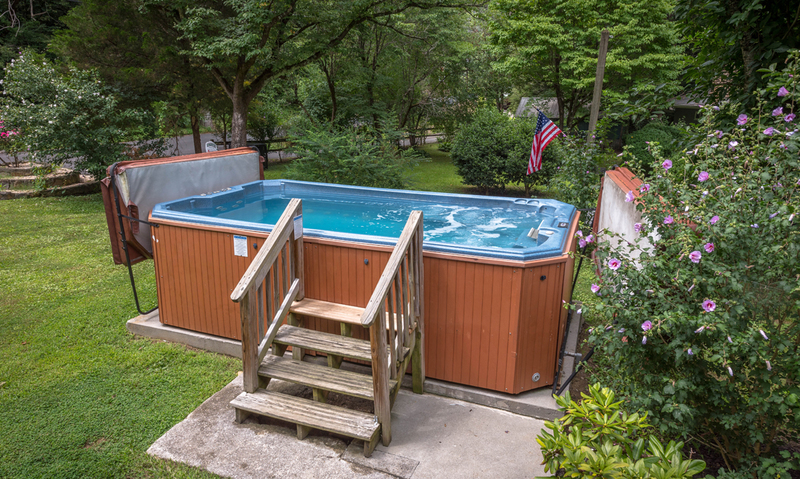 Once the sun sets, hop in the outdoor swim spa (7' x 14', 4 feet deep with a temperature of 95-104 max), where you can enjoy stargazing as you sit in the soothing water. 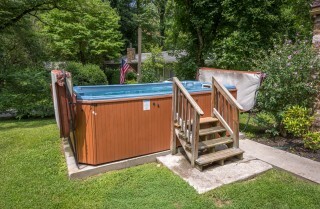 Perhaps you’re trying to escape from it all or maybe you’ll need to keep up with your work while enjoying your vacation. That’s no problem at Simone’s Cottage — simply bring along your laptop to access the free high-speed Wi-Fi. There’s also a provided washer and dryer, ensuring you have everything you need to fully enjoy your time away from home. 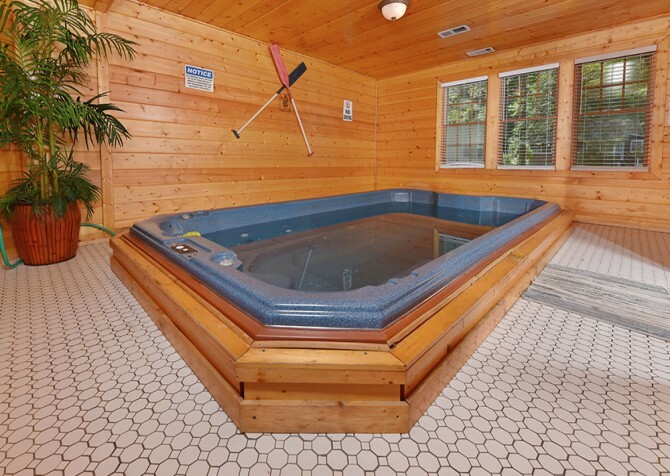 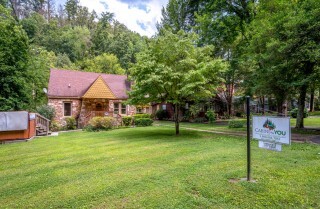 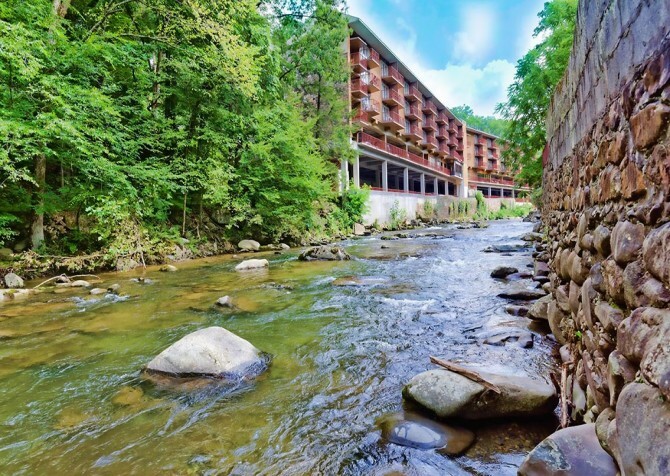 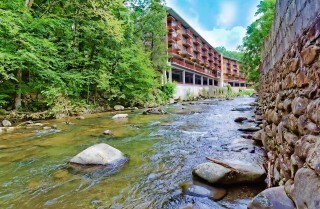 Another perk of staying at this Gatlinburg cabin is you’ll be within walking distance to other Cabins for YOU riverfront properties, such as On the River, River Romance, and Skinny Dipping. 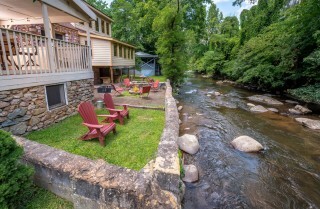 So, you can book riverfront cabins side-by-side with even more friends and family for an extra special trip. 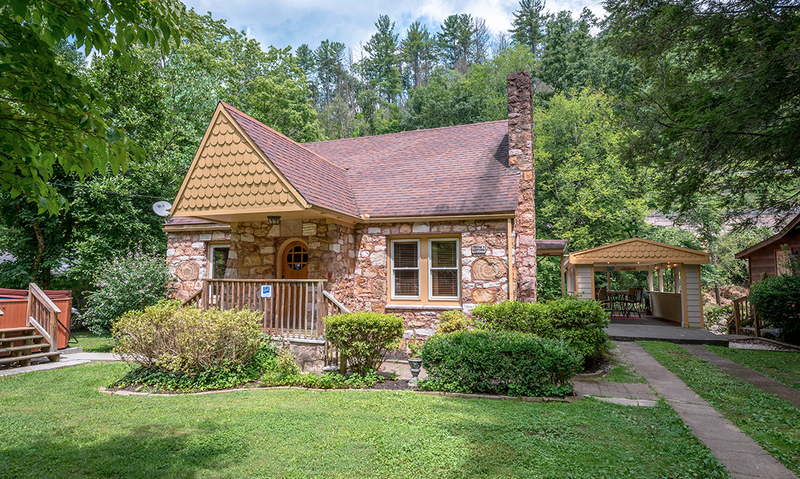 Best of all, Simone’s Cottage is a pet-friendly cabin, which means your fur baby can join you in the Smokies! 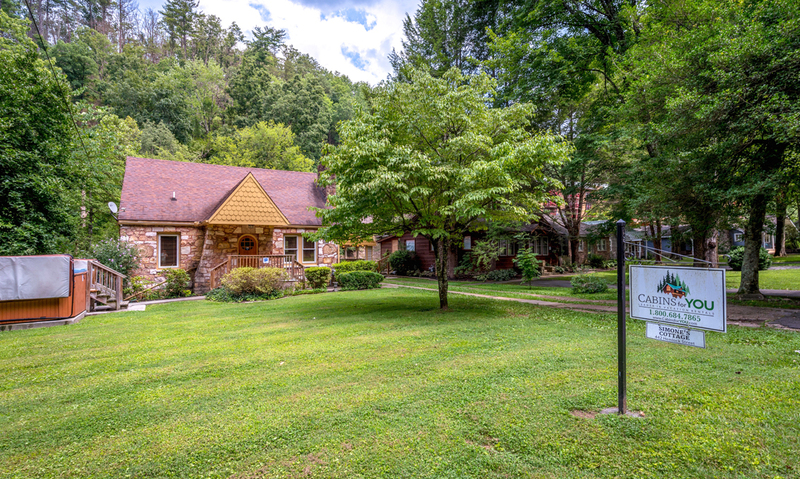 A smart choice for a family vacation or a getaway with friends, Simone’s Cottage keeps you within walking distance to downtown Gatlinburg attractions, shops, and restaurants — less than 1 mile away! Plus, the roads are smooth and easy, so you can enjoy the short ride or brisk walk to town. 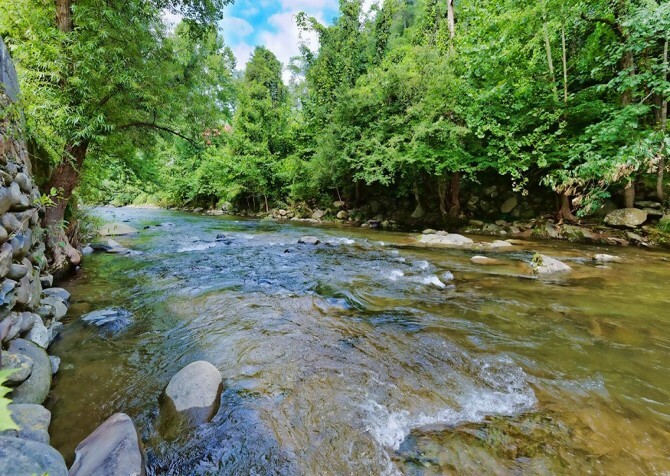 Watch schools of character-rich fish swim by, walk under roaming sharks, see adorable penguins up close, and pet jellyfish at Ripley’s Aquarium of the Smokies! 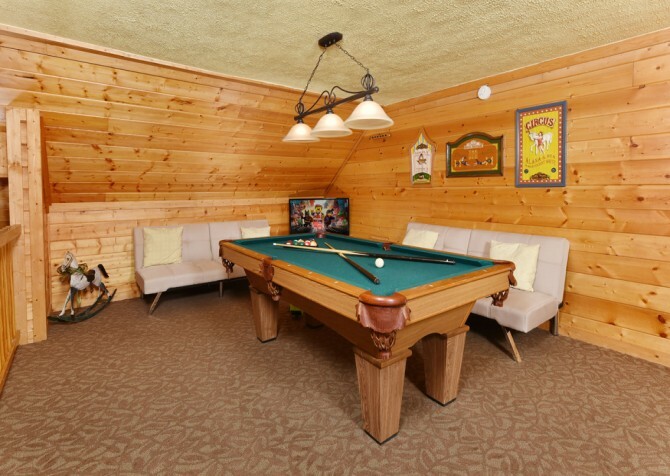 Munch on a corn dog, down Hawaiian shaved iced, play arcade games for hours on end, then redeem your game card points for prizes at Fannie Farkle’s! Soar around sharp turns or take an easy ride on the Gatlinburg Mountain Coaster, where you control the speed — 30+ miles per hour! 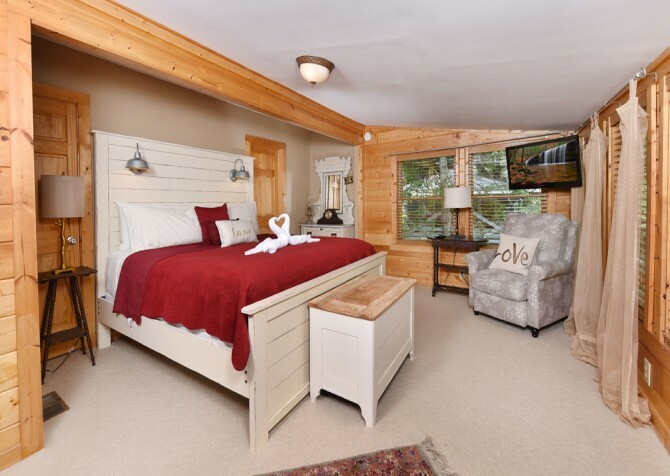 "Loved staying here..It was so peaceful. The cabin was very comfortable. It was just perfect for our visit. 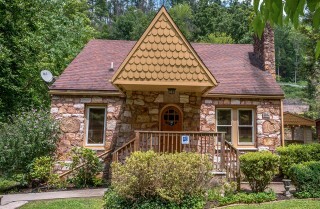 Plan on booking for 2019. Thank you for such a lovely place." 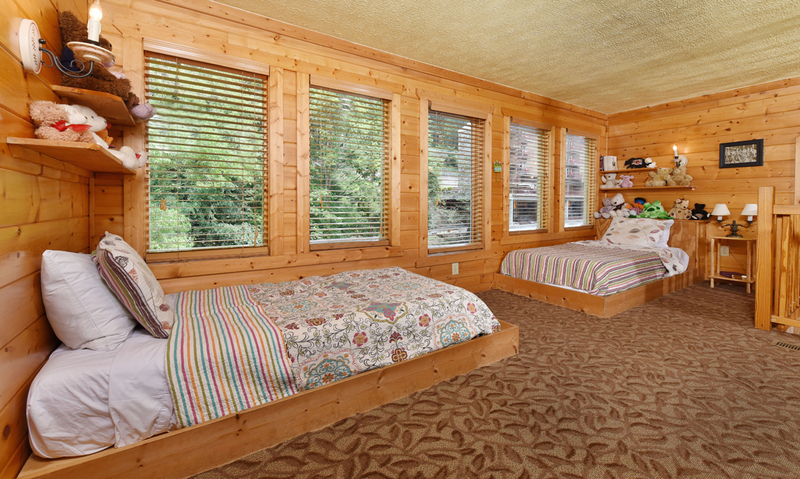 Peaceful and comfortable is just what we want to hear! We couldn't be happier at how much you enjoyed your stay at Simon'es Cottage, and we look forward to your next visit! 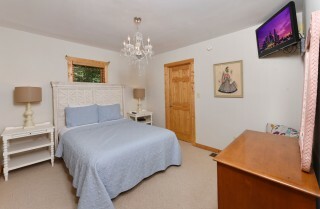 "I just have a wonderful experience in galitburg at Simone’s cottage! Nice and very clean place close to town in a beautiful area I definitely coming back to this Cabin!! Thanks Cabin for you!" 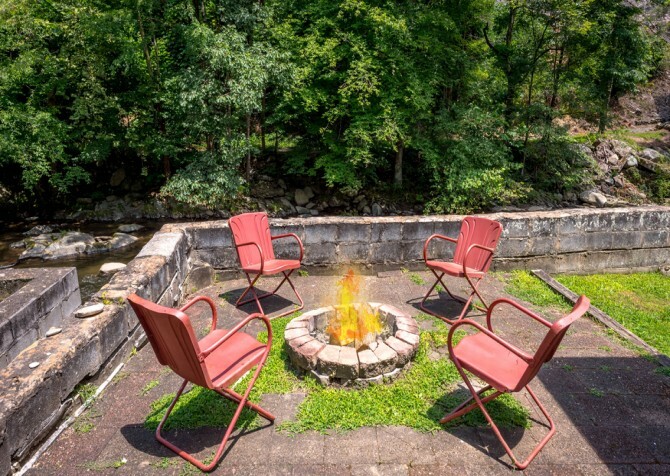 "This was our first rental and it was amazing!!! 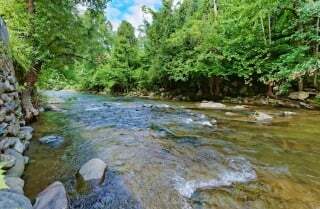 Perfect!!"